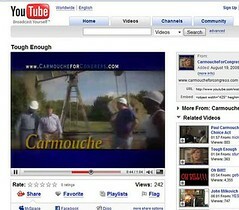 Caught the tail end of a new ad for Paul Carmouche on KTBS last night. This screen capture is not from that ad. In the new ad he says something like "our energy future is here" and he's standing in front of a oil rig. Where are our local, regional and state leaders who are for new sources of renewable energy? If other locations are exploring new technology and creating new jobs why can't we? For instance wind energy is being harvested in downtown Chicago. Here's a look at how other American cities are working towards sustainability. Popular Science has list of 50 communities that are hot when it comes to environmental action.